The Ponseti method of correction of congenital clubfoot is recognized as the preferred management technique for this pediatric deformity. The original method has been subtly modified over time in response to clinical experience and research findings. Most recently, two randomized controlled trials have shown that less time is needed for each serial cast immobilization. Clinical cases from the Kingdom of Tonga are presented to illustrate the clinical use of more rapid plaster cast changes – the ‘fast casts’ modification incorporating increased manual manipulation time, within the Ponseti method. 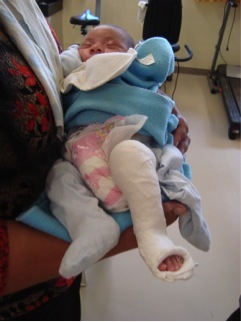 The Pirani score was used to monitor the clubfoot correction between each plaster cast change for each baby. In all feet the Pirani scores reduced sequentially with shorter periods of casting. Shorter duration of cast immobilization – ‘fast casts’ – can be used with many advantages for the clinical setting. Less time in plaster can at least halve the corrective phase of Ponseti management without compromising results. In addition, there are possible benefits for families from distant locations, for babies being less prone to skin irritations, and less difficult day-to-day baby care related to long leg plaster casts. These factors may benefit compliance and overall treatment outcomes. Whilst management with splints, binding, and plaster casts has been evident across the hundreds and thousands of years in which clubfoot deformity is referenced, the 20th century saw such conservative measures subsumed by surgical correction, and notably the posterior medial release (PMR). [5-7] The PMR is a joint invasive procedure, which also severs to lengthen, all the soft tissue structures found contracted on the medial and posterior aspects of the infant clubfoot. In the 21st century, surgical correction of clubfeet has been firmly denounced. Both retrospective concerns and reviews, and prospectively designed studies have shown the poor outcomes, in terms of pain and function, resulting from the PMR and akin surgical procedures. Simultaneously, the Ponseti method, developed and named after the orthopedic specialist Ignacio Ponseti, has been investigated both retrospectively and in many prospective randomized controlled trials (RCTs), and found not only to give the best clinical outcomes, but to also be a more economical management, when compared to surgery – the rare health care setting finding of a ‘win:win’. The duration of each serial plaster cast, a fundamental aspect of the basic weekly casts which made up the original Ponseti method now has good evidence for amendment. The original method described by Ponseti involves a series of plaster casts changed weekly for a period of five to six weeks, followed by percutaneous elongation of the Achilles tendon and application of a final cast for three weeks. The foot abduction bracing phase, is commenced immediately after the post tenotomy cast is removed. There is now strong evidence to suggest that accelerated frequency of cast changes has comparable outcomes to those of the original Ponseti method. with the benefit of limiting time spent is casts during the corrective phase of treatment. How can the notion of ‘fast casts’ be applied clinically, and what are the possible pitfalls as well as benefits? Two cases from Tonga, the country with the world’s highest incidence of congenital clubfoot deformity, are included in this review. 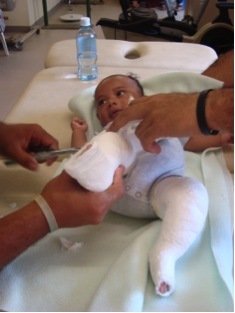 In Tonga, a pacific island country geographically comprised of numerous islands, clinical use of the ‘fast casts’ method facilitates coordination with the availability of surgical expertise to perform Achilles tenotomies, as well as accelerated progress of babies through the casting stage. Both of the case-study babies were cast and re-cast four times in one week. This is more rapid and intense than might normally occur due to the visit from the off-shore surgeon occurring the following week (the local surgeon has now undertaken training for tenotomy procedures). Figure 1 Baby J, whose data is presented in table 2. 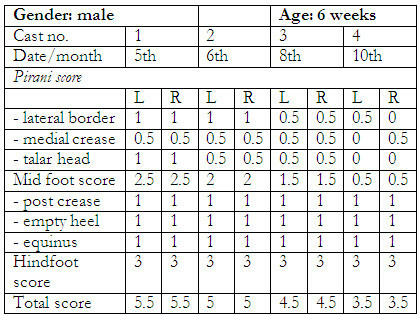 Table 1 Baby J – left congenital clubfoot. The use of ‘fast casts’ saw this baby’s corrected and ready for the tenotomy procedure after six days (4 casts). Figure 2 Baby S, whose data is presented in table 3. 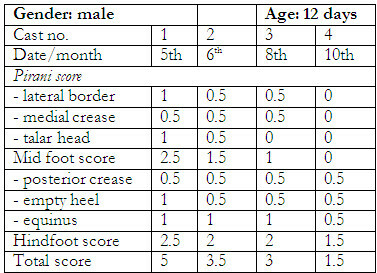 Table 2 Baby S – bilateral congenital clubfeet. The use of ‘fast casts’ corrected the cavus and adduction of the clubfoot deformity, but made no change to the equinus component, which required the tenotomy for correction (as indicated by the initial Pirani score). As the Tables 1 and 2 show, both babies showed consistent correction of their foot deformity with manipulation and casting. (Fig. 1 and 2) The Pirani scores reduced consistently within the initial corrective phase, showing the value of using this demonstrably reliable and objective measure. Further, the initial Pirani scores of 5 and 5.5 respectively, heralded the very likely need for tenotomies. Indeed, the hindfoot scores equaled or approximated the total Pirani scores after the casting phase, signaling the residual equinus aspect of the deformity. It must be stated that similarly to the findings of the clinical trial by Xu et al, that these Tongan cases also underwent ‘more rather than less’ manipulation prior to casting. Whilst the effect of manipulation time has not been formally studied, histological investigation directs maintained loading of ligaments to promote the lengthening or ‘uncrimping’ of these structures. Might it be that more attention to, and time spent, carefully manipulating clubfoot correction is able to render cast time less relevant? There are many factors to consider when contemplating the use of ‘fast casts’ as part of the Ponseti clubfoot correction method. Firstly, there is now very good evidence to support shortening cast time for the typical, congenital clubfoot deformity. Secondly, the convenience for parents travelling with infants to distant clinics for treatment which necessitates time away from home, work, and family, a common occurrence in developing countries, may be greatly improved. [26-28] If, as on average, a baby requires six casts, the time away from home/work may be reduced from six weeks to two weeks. This could provide great savings for costs incurred whilst living away from home, and time lost from work. In turn, compliance may also benefit. Thirdly, less time immobilized in plaster is probably advantageous for the baby in terms of reduced skin sore issues, easier bathing, more normal motor development and possibly lessens the risk of osteopenia. Notable in the current findings on faster casting is the longer manipulation time, (two minutes) specified by Xu, et al., , an additional departure from the original Ponseti protocol, and also the long follow up time of this study, as opposed the otherwise similar Malawi trial. It is important to appreciate that all accelerated casting studies and trials have addressed the typical congenital clubfoot, and that the effects and use in syndromic or complex clubfoot types are unknown. The application of best available evidence to any health care setting is important, particularly if there are clear benefits to the recipients of this care. The rescheduling of the weekly clubfoot clinic for casting, to at least twice weekly, is now a possible shift in contemporary evidence based practice. The Ponseti method continues to be the best approach to correction of the typical congenital clubfoot. There is now high-level evidence to support changing casts after three days or less, which greatly reduces the time infants spend immobilized in plaster. The pre-casting manipulation is important and indications are that more time spent may be beneficial in correcting the clubfoot deformity. In developing countries where travelling to clinics necessitates time away from home, work, and family, the adoption of ‘fast casts’ can reduce costs to families, and perhaps help to improve compliance and overall outcomes.